The weather was perfect last weekend to stroll the 2012 fine art fair in Geneva, Illinois. More than 150 artists from around the country participated. Exhibits included photography, pottery, fiber, printmaking, glass, mixed media, watercolor, oil/acrylic, wood, sculpture, and jewelry. 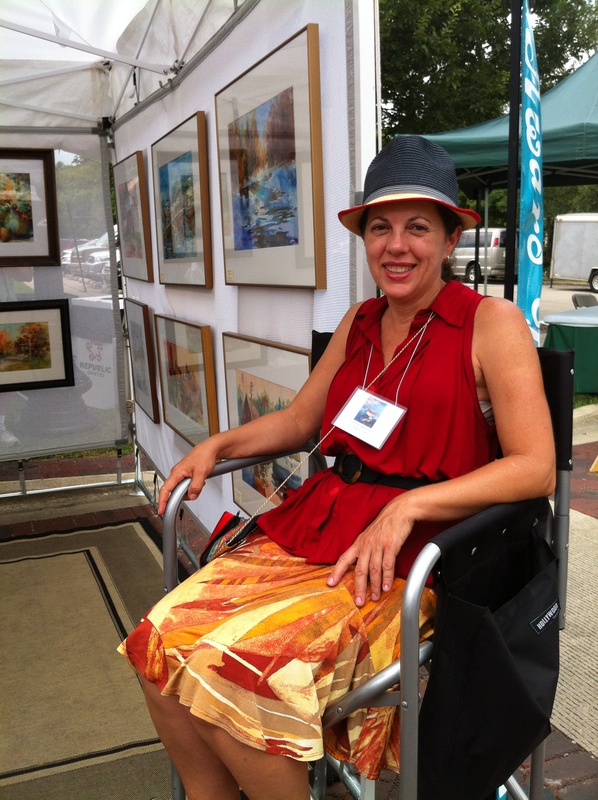 A local favorite, award-winning watercolorist Fatima Figueiredo (www.figtreestudio.com), displayed her romantic pieces. Fatima has a degree in Industrial Design and decades of experience. Her stunning paintings add class and sophistication to any room. Selecting an original work of art for your home is an investment in the unique creativity of an artist. Countless hours of thought and skill go into each piece that stirs us emotionally. A work of art can make us happy, offer a sense of peace, or even agitate us. Choose artwork that achieves the emotional goal you seek. For a listing of fairs near you contact your town’s chamber of commerce or go online to http://www.artfaircalendar.com/art_fair/central-us-art-fairs.html.